Delhi, BJP looked old. AAP wears imprimatur of a new revolution. India’s great churning continues, and with what a spectacular result. Amid all the nuances of psephology and the complications of sociology, the Aam Aadmi Party’s spectacular victory represents a hopeful pattern in Indian politics. Indian voters are looking for agents of change rather than stasis, hope instead of easy cynicism, aspiration instead of fear, positivity instead of defeatism, and the future instead of the past. Contrary to the mean arithmetic of social scientists, politics is less about ideologies, programmes, buyouts and freebies. Politics is always more psychological. It requires the projection of qualities that are not simple to project: sincerity, credibility, perhaps even a sense of adventure. Which is why politics is always more contingent. No alternative is perfect. But voters are willing to give a chance to those who, at a given moment, best represent this new disposition. Prime Minister Narendra Modi’s own victory was, in part, due to his ability to occupy this narrative. One simple way of looking at the story is this. In Delhi, the tables were turned. The BJP looked old and less credible. Led by the prime minister, it was more petulant than positive, aggressive than constructive, reeking of cynicism rather than idealistic, full of hubris rather than humility, and stale rather than new. 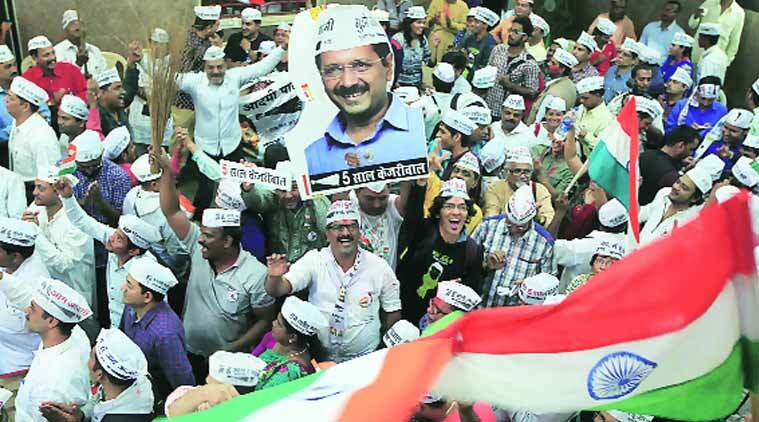 The AAP, on the other hand, wears the imprimatur of a new revolution. It is a party that defies the conventional wisdom that you need big money or a sectarian interest to be successful in politics. It is a party that, in response to the crisis of the Indian state, wants to deepen participation — in a new language of democratic experimentalism. In Arvind Kejriwal, it has a leader who, even in disagreement, exudes a sincerity that is impossible to match. He did what no politician has done in India. When he made a mistake, he simply said sorry. It allowed him to move on. It has, at least in Delhi, a genuine organisation with youth and idealism behind it, a cast of spokesmen who try to exemplify public reason more than clownish antics. Daniel Bell once said that the challenge of the modern state is that it is too big for the small problems in life and too small for the big problems in life. It has to articulate an idiom that addresses ordinary problems or ordinary people: petty corruption, electricity, water. The AAP hammered home these themes in a homely way. If the BJP has any sense, it will draw the right lessons. For one thing, it should break the cynical awe in which Amit Shah is held and empower other voices in the party. The line between being clever and being too clever by half is very thin. The BJP is now transgressing it — witness its shenanigans in Bihar. Second, voters are feeling betrayed by the BJP. The prime minister is now trapped by his own mystique. His vacillations in the face of reactionary elements in his party and the sense that the talk is running ahead of the walk are growing. The municipal elections in Rajasthan were also a signal about this in minor key. Third, Modi now has a Congress problem. Other than the ones who predate Modi, the BJP is failing to nurture local leaders who have an independent base and voice. Cooperative federalism cannot be run with a centralised party. The BJP should be grateful that it has got the jolt early enough to correct course. But Modi has to realise that political capital dissipates fast. But the AAP’s victory is full of possibilities. For one thing, it sharpens the battle against plutocracy, a major poison in Indian democracy. Second, it gives the Opposition some momentum. A different government with street power a few miles from Race Course Road is not to be underestimated, though the AAP will have to exercise judgement in using this power. Third, for a polity looking for a new kind of politics, there is now something of a model that can be replicated, at least in urban India and in states like Punjab, where the search for alternatives is growing desperate. Fourth, while the AAP has deep roots in the politics of the poor, it showed how it could also reach out to the middle class, particularly younger voters. It is also a pointer to the BJP that even a slightest consolidation of the non-BJP vote bodes ill for it. In terms of long-term structural changes, there are two tantalising possibilities. The first is the creation of a new institutional culture. This includes not just the performative dimensions of the relationship between politics and the people, but also far-reaching institutional changes: authority and accountability could be relocated in ways that are more functional. The entire architecture of urban governance — the relations between state governments and local bodies and development authorities — needs to be set on a new footing. This will be Kejriwal’s first challenge. The second challenge and opportunity is this: It was fashionable to portray the AAP as unleashing another populist class war, fiscally imprudent and insensitive to growth. This was a gross exaggeration unleashed by those who were engaging in class warfare anyway. But the central challenge facing India is how to create cultures of negotiation around important issues where we do not oscillate between cronyism and populism. All the important issues facing us — pricing water and electricity, managing land and environment, access to health and education — have been stymied by this oscillation. Even now, the fog of obfuscation and false choices in these areas is threatening our future. Creating credible and inclusive negotiation on these issues is the central task. In India, the rich have evaded accountability by raising the spectre of class warfare, and the poor have been cheated by populism. There has to be a liberal critique of oligarchy at the top, and a social democratic critique of populism at the bottom. We hope the AAP is the harbinger of this change. As a parenthetical aside, the ridiculous campaign by some sections of the left intelligentsia that this election would be rigged or that somehow elections are bought merely by money or deluding rhetoric needs to be mentioned. It not just shows their bankruptcy. It also shows that they have not grasped the most important thing about India: democracy now has the passion of a religion, the thrill of a mystery. Anyone who doubts it, or shows contempt for it, through hubris or condescension, will come to grief.